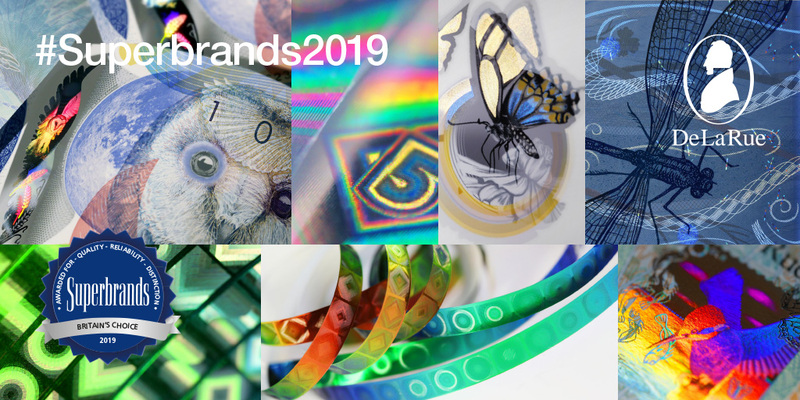 De La Rue is delighted to announce it has been voted a 2019 Superbrand by a council made up of UK business professionals and marketing experts. The annual Business Superbrands survey has been tracking the perception of a wide-range of business brands in the UK since 2001. This year’s survey evaluated just shy of 1,600 brands across 63 categories from ‘Accountancy & Business Services’ to ‘Waste Management & Recycling’. Only the most highly-regarded brands from each category are awarded Superbrand status. All voters were asked to judge brands against the three core factors inherent in a Superbrand: quality, reliability and distinction. Additionally, the council review a variety of both short and long-term factors, from the brand’s current profile to its latest marketing activities and new product and service developments, giving a holistic picture of how brands are currently perceived. De La Rue sees its brand as a key tool in differentiating itself from the competition, creating loyalty with customers and as a representation of who they are and what they stand for, with an ultimate goal of building trust in the market and creating the right environment for sales and business development. De La Rue, alongside a selection of other identified Superbrands, is showcased in the Superbrands Annual. The book celebrates each brand and explores the history, development and achievements of the nation’s leading brands, providing valuable insights into each brands strategy and proposition. Read more about Superbrands and view De La Rue's full profile here. 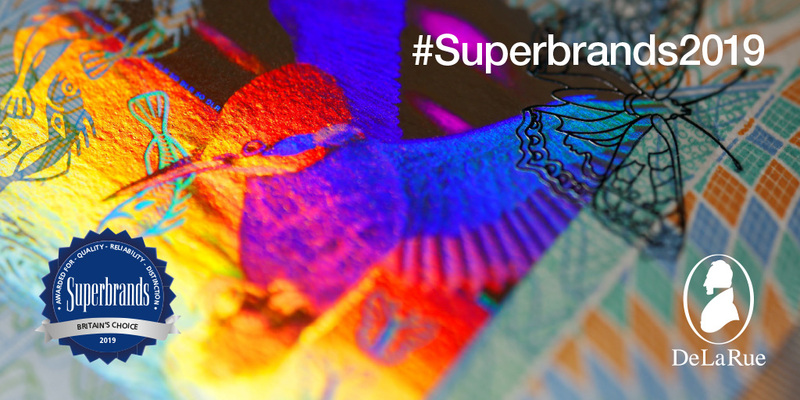 De La Rue, alongside a selection of other identified Superbrands are celebrated in the Superbrands Annual. The book explores the history, development and achievements of the nation’s leading brands, showcasing why they are well-regarded and providing valuable insights into each brands strategy and proposition. More information can be found on the Superbrands UK website: www.superbrands.uk.com. De La Rue’s purpose is to enable every citizen to participate securely in the global economy. As a trusted partner of governments, central banks and commercial organisations, De La Rueprovides products and services that underpin the integrity of trade, personal identity and the movement of goods. As the world’s largest designer and commercial printer of banknotes, De La Rue designs, manufactures and delivers banknotes, banknote substrates and security features to customers in a world where currency will continue to be a key part of the developing payments eco-system. De La Rue is the only integrated supplier of both paper and polymer banknotes, and creates security features that ensure banknotes are protected against counterfeiting. De La Rue is the world’s largest commercial designer and printer of passports, delivering national and international identity tokens and software solutions for governments in a world that is increasingly focused on the importance of a legal and secure identity for every individual. De La Rue also creates and delivers secure product identifiers and ‘track and trace’ software for governments and commercial customers alike to help to tackle the challenge of illicit or counterfeit goods and the collection of revenue and excise duties.